The Visit Granbury public relations and marketing team takes tremendous pride and works very diligently in assisting print, broadcast, and web-based media professionals with stories about Granbury. 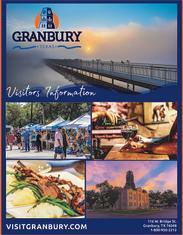 Granbury, Texas is a wonderful leisure destination, and we love the opportunity to promote it in the media outlets of our target areas. We understand that this is an enormous value and impact to our local economy, and the destination as a whole. Below, we have highlighted several feature pieces with an active link, including print, digital and live television placements. There are many more media features showcasing Granbury that were coordinated by Visit Granbury, but we just wanted to highlight a few for you! Since the beginning of Visit Granbury just three years ago, the team has worked and earned Granbury over $3 million of earned media placements, including fiscal year 2018 YTD. Mary Lester of MPL Public Relations, earned this media coverage for Granbury through her industry relationships with these media outlets. These are all earned (unpaid) placements, and they have been seen by hundreds of thousands of people in our target markets. If you ever have a question about Granbury’s media features, contact us here.